Students are making music in New College — but not in the traditional sense. The students enrolled in Dr. Andrew Raffo Dewar’s NEW 490 Handmade Sounds: A Hands-on History of Electronic Music are following the evolution of electronic sound by creating their own music. 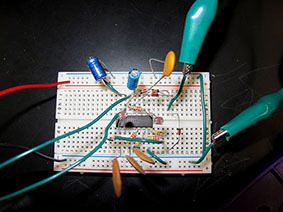 A student in Andrew Dewar’s New College course “Handmade Sounds: A Hands-on History of Electronic Music” built this simple two-voice light-controlled synthesizer prototype using found electronics. Dewar cites the origins of concrete music or musique concrete as an example. In 1940s France, composers Pierre Schaeffer and Pierre Henry began to experiment using early recording devices to create records of everyday noises such as the wind or squeaking doors, which would then be incorporated into musical compositions. Simultaneously in Egypt, composer Halim El-Dabh was making similar discoveries. To teach this concept, Dewar sends his students around campus with modern digital recorders to capture the sounds of The University of Alabama. The recordings are then turned into music using the free sound editing software Audacity. Students gain more than an academic understanding from this process. “This brings the history alive for them,” Dewar says. By applying the knowledge gained, students are retracing the historical foundations of modern music while tapping into their own creativity to construct original works.